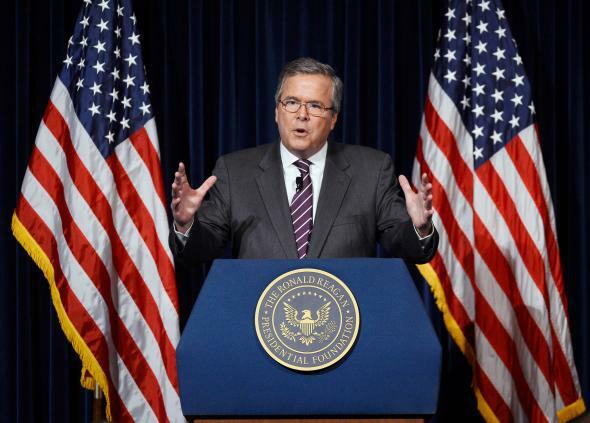 Jeb Bush shames poor and single moms: America still does the same. Jen Bush in Simi Valley, California, in 2013. For the soon-to-be-announced presidential candidate—and for many states—shaming the poor is as American as apple pie. Early next week, former Florida governor Jeb Bush is expected to announce that he’s running for the Republican presidential nomination. While he’s been acting like a candidate for some time, this looming deadline has inspired some to dig back into his past musings and take a look at Profiles in Character, the 1995 book he co-authored. Shame is not for everyone: Bush had some specific groups that he wanted to ostracize in order to change their behavior. One that gets a good deal of ink is women who have children outside of marriage. He writes, “One of the reasons more young women are giving birth out of wedlock and more young men are walking away from their paternal obligations is that there is no longer a stigma attached to this behavior, no reason to feel shame.” He pines for the days of the Scarlet Letter (missing the point of Hawthorne’s novel). Another constituency primed for shame is the poor. “For many, it is more shameful to work than to take public assistance—that is how backward shame has become!” he remarked. Fortunately for Bush, shame has never really been in short supply. Our social safety net is designed with shame in mind; despite evidence that it has little positive effect or even grounding in reality, we heap humiliation on those who seek out public assistance. There are already policies aimed to deter unwed mothers from having more children. Sixteen states currently have family caps in place for their welfare programs; benefits stop increasing after a certain number of children. The caps sprang from a Republican proposal in the 1994 Contract with America explicitly aimed at stopping poor and single mothers from having more children. As Jamelle Bouie has written, they were meant to “discourage illegitimacy and teen pregnancy by prohibiting welfare to minor mothers and denying increased [benefits] for additional children while on welfare … to promote individual personal responsibility.” A federal requirement to institute caps never passed, but states were allowed to implement their own. There is no evidence that they work, however, and no evidence that they’re even addressing a real problem. A 2001 Government Accountability Office report couldn’t conclude one way or the other whether the caps have any impact on birth rates. Meanwhile, people on public assistance have about the same family size as people who don’t receive assistance. What caps do end up doing is pushing people further into poverty while painting poor women as sexually promiscuous and irresponsible. The caps aim to shame these women out of making decisions about their own family sizes that those with more means are free to make without the same scrutiny. The notion that public assistance writ large doesn’t come attached with enough stigma is also a bit preposterous. Research has found that it’s strong enough to keep some people from participating altogether. But lawmakers have recently been interested in increasing that stigma. Seven states have started drug testing welfare recipients under the notion that people who use drugs shouldn’t get assistance from the public. They have collectively spent nearly $1 million to administer these tests, although they’ve gotten more creative in how they design the regimes after courts struck down Florida’s attempt to drug-test every person who applied. The rate of positive tests, however, is miniscule compared to drug use rates among the general population—ranging from 0.002 percent to 8.3 percent, nearly all below 1 percent. Americans at large use drugs at a rate of 9.4 percent. That hasn’t deterred a number of other states from trying to do the same thing, however. Wisconsin Governor Scott Walker has gone even further, proposing that his state start drug-testing people who want to receive food stamps or unemployment insurance. States have also been trying to crack down on food stamp users by limiting what they purchase with the benefits. While none have actually gone through with it—because they would have to tangle with the federal government, which has much stronger oversight over the Supplemental Nutrition Assistance Program—this year Maine, Missouri, and Wisconsin have discussed restrictions on food stamp purchases to ban them from including “junk food.” At least eight other states have previously considered doing the same. Since there aren’t any actual standards as to what constitutes junk food, the restrictions can quickly get ridiculous. A version of Wisconsin’s proposal would bar shellfish and make it more difficult to buy spices, dried beans, and pasta sauce. Missouri’s lumps seafood and steak in with cookies, chips, and soft drinks. Incidentally, there’s also little evidence that people who use food stamps are making worse choices when they go food shopping; the random red-listing of certain items only makes it harder to navigate a checkout line. Not all recipients of government assistance have to endure these kinds of humiliations. No one who uses the home-mortgage interest deduction has to pee in a cup first. No student who takes out a federally subsidized loan faces restrictions on which major she chooses. Medicare recipients aren’t told to limit their families to a certain size. But we go out of our way to implement these demeaning policies among evidence that they don’t even work. As a country, we’ve bought into the idea that poor people deserve shame for their financial struggles.